What can you tell me about different screenwriting programs? There are a number of software programs out there including, of course, Dramatica, in which I had a hand. 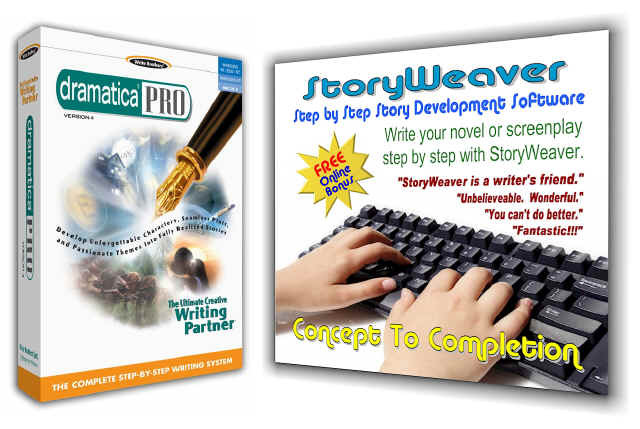 The various programs fall roughly into two categories: script writing/formatting programs and story creation programs. As far as I know, there are no programs currently on the market that do both functions. Of the script writing/formatting programs, Script Thing, Final Draft, and Scriptware are perhaps the best known. The company that distributes Dramatica also has a formatter called Scriptor, but although it recently won an Academy Award as a pioneer software for the industry, it is dated and therefore is not compatible with many new word processors. That's why they have recently come out with Movie Magic Screenwriter, which has all the most up to date technology and tools and is soon to import Dramatica files directly into the formatter/word processor and included 3x5 card system..
As for story creation software, the best known are Truby's Storyline, Collaborator, and Dramatica. Each approaches story in a different manner, so different writers will have different preferences. Truby's Storyline is a version of the "hero's journey" approach to story creation. It provides shorelines, step by step templates, and several examples, and incorporates many of the cogent points from Truby's classes. Collaborator is based on Aristotle's "Poetics", and provides a question and answer approach to filling in all the information called for by Aristotle in his description of what makes a good story. Dramatica is based on a whole new theory of story, which can be daunting, but also has many new perspectives never before available to writers. The heart of the software is a "story engine" based on the theory, which keeps track of the relationships among dramatic elements in your story to ensure consistency. My suggestion would be to try them all and see which one fits best with your creative approach. Most, if not all, have a 30 day money back guarantee, so you can test drive the software and send it back if it is not what you want. Some writers find that using two or more of these programs at different stages of the creative process is useful. Naturally, I have a preference for Dramatica, having worked hard to make it something truly special for the creative writer. Still, I have tried all the others and found each of them to have its own personality, which makes the choice of tool as much an emotional one as a practical one. The best deals are usually found through the mail order catalogs such as Mac or PC Warehouse, etc. You might also want to stop by a store such as The Writer's Computer Store, where you can try out all of these programs right there, saving you the trouble of buying and then potentially returning them. If you are interested in learning more about Dramatica, the software, you might also want to browse Screenplay Systems' Dramatica Home Page on the web at http://www.dramatica.com/ . If you are interested in learning more about the theory, just visit Melanie's Dramatica Pages at http://storymind.com/dramatica/ where you will find a special "on-line edition" of the entire 450 page book, "Dramatica: A New Theory of Story" and lots of other support materials as well. We put the book up because we feel the information contained is so valuable and essential that as writers ourselves, we want to share it for free, even if it doesn't result in any sales at all. In addition, I teach a nine week course in Dramatica theory through U.C.L.A. twice a year. The course covers The Elements of Structure and The Art of Storytelling. Currently, free software is included with the course. Contact U.C.L.A. Extention for further information. Thanks for your interest, and best of luck in finding the software tool that will work best for you and also enhance the creative process.